The Prophet RAEL disapproves the declarations of Cardinal Rosalio Castillo Lara, the most senior Catholic clergyman in Venezuela who says that the government of Hugo Chavez appears as a dictatorship and has lost its democracy. What should we say about the Vatican whose leader, the Pope, has absolute power in his state and is elected for life? Where is the democracy in the Vatican? 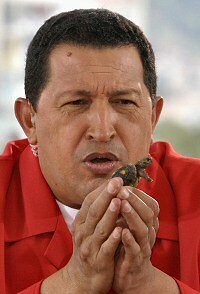 The Catholic Church also accuses President Chavez of lacking religious neutrality. In a letter sent to President Chavez, Rael proposes to go immediately to Venezuela to show his support and publicly denounce the Catholic Church that has been the accomplice of the colonization that lead to the massacre of the indigenous people of South America. It is also for this reason that Rael invites the Venezuelans to massively apostatize from the Catholic religion that is only opium for the people and a religion imposed brutally on their ancestors. It is always important to recall that the Catholic Religion built a major part of its fortune thanks to the pillaging of the victims of the massacres done in South America. Venezuela's leader has demanded an explanation after a Roman Catholic cardinal said that the country was becoming a dictatorship.